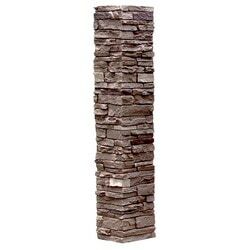 StoneWorks Faux Stone 2 Piece Railing Post Covers are a unique, simulated rock and stone product perfect for sprucing up your residential or commercial deck railings. With the look and feel of authentic stone, these covers can be easily integrated into most deck or porch designs, working equally well with wood, composite and vinyl railings. Post Cover Cap and Converter Kit are sold separately. Please see below for further details. This was a great experience and should I ever have the need or opportunity to get more building products, this is my store!